Another Safety Issue: Can Toyota Ever Bounce Back? 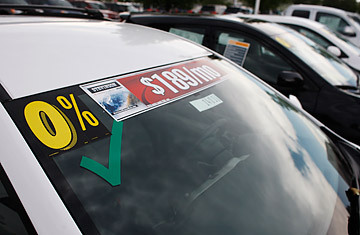 A Toyota dealership advertises a 0% interest rate on the windshield of an unsold 2010 Toyota Matrix in Lakewood, Colo. The flood of recalls  nearly 9 million vehicles in the past 12 months  and reams of nasty publicity involving runaway cars and unintended acceleration seemed finally to have abated for the beleaguered automaker Toyota. Then, on Tuesday, the National Highway Traffic and Safety Administration (NHTSA) said it was intensifying its investigation into another potential Toyota safety issue: sudden-stalling problems on its Corolla and Matrix models. This new NHTSA move, a formal engineering investigation of the Matrixes and Corollas from model years 2005 to '07, stems from more than 1,000 complaints that have been received by Toyota and the NHTSA. It could possibly lead to another major round of recalls if mechanical or electrical problems are found. The investigation is just the latest in a barrage of challenges  and heavy damage  to the once gilt-edged reputation of the world's top automaker. While solidly profitable during the first quarter of fiscal year 2011, the company still has a way to go before it can repair that reputation. "They are still a successful company, they just aren't on a pedestal anymore," says Rebecca Lindland, an analyst with IHS Global Insight. "This controversy has damaged our reputation," acknowledges Toyota spokesman John Hanson, referring to the sudden-acceleration issue. But it's about more than just reputation: Toyota faces liability claims over incidents that have been blamed for 79 deaths and hundreds of crashes. Earlier in August, Toyota executives were heartened to receive a report from the NHTSA that the agency hadn't found any evidence that faulty electronics played a role in sudden-acceleration accidents, and instead suggested driver error was responsible  drivers may have inadvertently stepped on the accelerator instead of the brake pedal. "The NHTSA information substantiates our position that after many years of investigation, we have found nothing in our electronic-control systems that has led to unintended acceleration," Hanson says. Still, the company faces plenty of legal troubles. Earlier this month, a Minnesota trial judge ordered the release of a man imprisoned after a fatal accident involving a Toyota Camry. Koua Fong Lee was sentenced in October 2007 to eight years in prison for reckless operation of his car when he crashed into another vehicle, killing the driver and his two young passengers. But in four days of testimony, Lee's attorneys refuted Toyota's claim that the Camry was not to blame for the crash. An inspection of the Camry found a cable actuator in the cruise-control mechanism stuck in the open position. Toyota faces more than 200 lawsuits involving faulty throttles and other types of problems. Meanwhile, a grand jury in New York City is looking into charges Toyota covered up problems in some of its vehicles. The automaker is responding on several fronts. So far, Toyota has repaired 48% of the 5.4 million vehicles it recalled last winter for potential pedal entrapment by an unsecured or incompatible floor mat, which Toyota maintains is the root cause in the episodes of unintended acceleration. Toyota officials say 80% of the 2.6 million cars in a separate recall aimed at cars equipped with potentially faulty or sticking accelerator pedals have also been fixed. The cost of all this is estimated by analysts to exceed $2 billion. Those estimates do not include the considerable cost of Toyota's aggressive sales incentives  cash rebates, 0% financing, etc.  in an effort to protect its market share in the face of negative publicity. Ivan Drury, of Edmunds.com, which tracks incentive spending among various automakers, notes that Toyota, which has long disdained incentives, is more dependent on them than ever. Though it still does not spend as much on incentives per vehicle as Chrysler and General Motors, Toyota's spending was up 70% in July over levels a year ago and has jumped from about $1,400 per vehicle in January to more than $2,200 today. "They're a lot closer to the industry average of $2,700, and it doesn't seem like they're going to stop," says Drury. Toyota needs the incentives to ensure the loyalty of its older baby-boomer customers  loyalty that was a given in years past. These older consumers are more important than ever because many recent first-time Toyota buyers, typically young, haven't had a very good first experience, which makes them questionable as repeat buyers, notes IHS's Lindland. Yet despite the richer incentives, Toyota's market share has slipped by almost a point this year. Sales of Toyota passenger cars in the U.S., long the company's strong suit, have increased a meager 2.8% so far this year, leaving Toyota more dependent on sales of vans, SUVs and pickup trucks. Industry-wide, passenger-car sales are up 12.8%; Hyundai's car sales have climbed 21%, while Ford's are up 18%. Steve St. Angelo, Toyota new chief quality officer for its North American operations, says the company is learning from its mistakes and is actively looking for ways to improve. "We're also going the extra mile to conduct on-site investigations of consumer complaints," he told a recent gathering of industry executives. In the past, Toyota often left it up to dealers to handle customer complaints. Toyota also has a lot of cash and a large base of longtime customers to help mount a comeback. But it has taken Ford nearly a decade to rebuild from the awful publicity around faulty Firestone tires on the Ford Explorer, and it took Audi nearly 20 years to come back for its own unintended-acceleration controversy in the late 1980s, when the company's annual U.S. sales fell from 70,000 units to less than 10,000. Halos, once lost, are hard to reclaim. "They're spending millions of dollars on public relations to convince consumers their cars are safe," notes Sean Kane, of Safety Research & Strategies, an outspoken critic of Toyota. "This is a p.r. battle for them right now," he says. Of course, Toyota first has to get out of the NHTSA spotlight. See more on Toyota's checkered history of safety issues. Read "Toyota Recalling 1.13 Million Corolla, Matrix Models Due to Stalling."